This chicken recipe gets its deliciously sweet flavour from orange juice concentrate. When mixed with the dressing, it makes a sticky sauce that can’t be beat. This recipe is perfect for a quick weeknight dinner since most of the ingredients you probably already have on hand. Your family will be licking their fingers in no time! Spread chicken in a single layer on shallow pan. Bake 40 min. or until done (165ºF) and, turning half way. Meanwhile, in medium saucepan, combine remaining ingredients. Bring to a simmer and cook until mixture has thickened, 18 to 20 min. Transfer chicken to large bowl, add glaze, and toss to coat; discard remaining sauce. Return chicken to pan and broil on HIGH 1 to 2 min. or until sauce is bubbling. Add sliced green onion for a pop of colour! 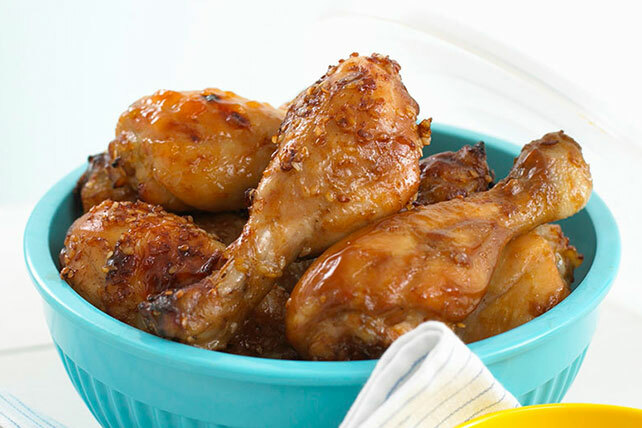 Try this recipe with chicken wings instead of drumsticks for an appetizer idea. Reduce cook time by 10 min.